Once again it's Kentucky Derby time and this year I've teamed with Four Roses Bourbon to bring you another great Derby Cocktail. Last year I did a Brown Sugar and Peach Mint Julep variation of the signature Kentucky Derby Julep cocktail. This year I'm giving you a cocktail riff and a sweet snack, both inspired by the famous chocolate and nut Derby fans pie. If you ever had Mayday Pie at the Kentucky Derby you're familiar with the dessert, as it and numerous other Kentucky area chocolate nut pies, including the Kern Family DERBY-PIE®, are all versions of an iconic Southern chocolate, nut (and often bourbon) pie. Ask all around Kentucky what to eat and drink at Derby time and you'll hear two things, Mint Julep and what locals call "Derby" pie. The "official", trademarked version, DERBY-PIE®, was created in 1950 by George Kern for the Melrose Inn in Prospect, Kentucky and got its name from a family hat draw. The Kern family is fiercely (and legally) protective of it's trademarked pie, but it is just one version of the traditional Southern chocolate nut pie, made with walnuts and NO BOURBON. Despite all the legal brouhaha and in-fighting over the names and recipes, ALL the Kentucky nut pies, and other regional versions of this sugar, butter and egg confection (such as shoofly pie, sugar pie, butter tarts and chess pie) are - each and every one of them - descendents of Medieval sugar pies. Kentucky most likely got it's version by way of the French who brought their Tarte Au Sucre to New Orleans then added the local pecans after landing. But let's give Kentucky its due, it added BOURBON! Now, DERBY-PIE® does not have bourbon in theirs, bless their hearts, but most other versions do, after all we're talking about nut pies in the bourbon capitol of the world, Kentucky. And since it's Kentucky, we should also be talking pecans and not walnuts. 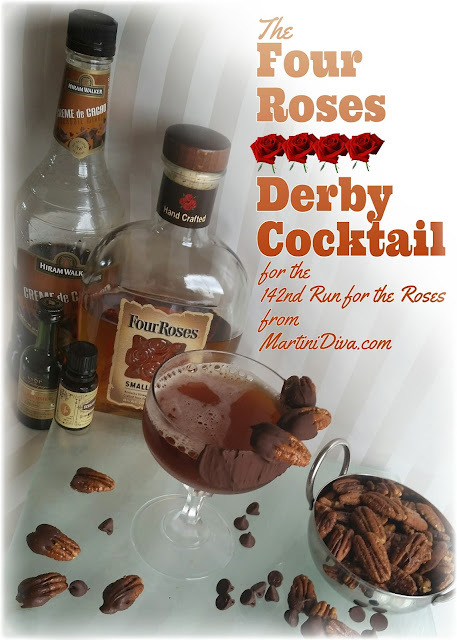 DIRECTIONS: Make the Four Roses Derby Pecans (Recipe below). *Use the leftover melted chocolate chips to paint half the rim of the glass. Add a few extra dollops of melted chocolate to the painted rims to anchor a couple of the Four Roses Derby Pecans to the rims. Chill the rimmed glasses in the refrigerator. Add the cocktail ingredients to a cocktail shaker and shake until chilled. Strain into the chilled, rimmed glasses and serve with extra nuts. DIRECTIONS: Preheat oven to 350. Mix together the pecans, brown sugar, salt, vanilla extract and the Four Roses Bourbon until all the pecans are evenly coated. Lay a piece of parchment paper on the cookie sheet and spread the pecans out in a single layer as separated as possible. Bake for 15-20 minutes. Using tongs remove the nuts to a clean sheet of parchment paper. Allow to cool. Add another sheet of parchment to the second baking sheet. When the nuts are cooled, add the chocolate chips to your microwave safe cup and heat in 30 second increments, stirring after each session, until completely melted. Do not over heat. Grab a cooled pecan by your fingers, dip halfway into the melted chocolate then place on the parchment. Repeat with the rest of the nuts. (* Use the remainder of the melted chocolate to paint the rim of your FOUR ROSES DERBY COCKTAIL Glasses.) Chill the finished Four Roses Derby Pecans in the refrigerator until serving time. P.S. Trust me, make a double batch of the bourbon glazed nuts, with or without dipping in chocolate, for snacking on later. 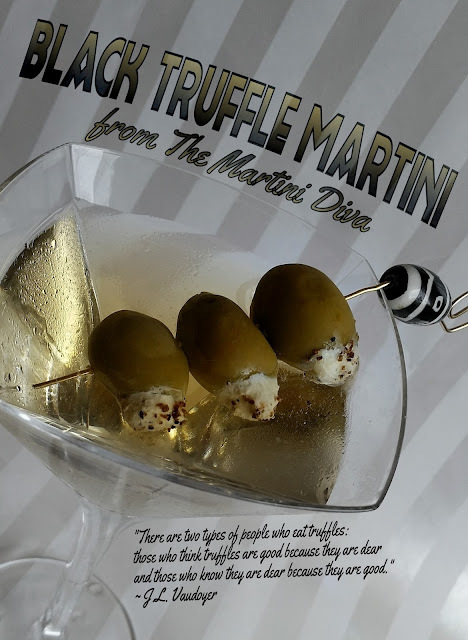 Most truffle cocktail recipes you will find will give you a sweet drink that employs chocolate in one way or another. That is because most people know about, and like, chocolate truffles. I'm one of those people and have created several chocolate inspired truffle drinks myself, including my Orange Truffle Martini and a Drunken Oreo Truffle Cocktail. They're delicious, no doubt about it but they're made with chocolate, not actual truffles. Those cocoa dusted chocolate "truffles" got their name from the "diamond of the kitchen", the edible fruiting body of subterranean Ascomycete fungi, commonly called truffles. These highly prized, very expensive fungi have an earthy, mushroom flavor that is loaded with umami that is highly prized by gourmands and chefs. 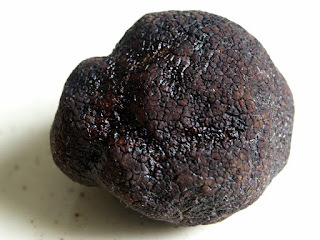 It also makes truffle a perfect flavor profile for a savory cocktail. When I discovered that there was a vodka infused with black truffles I decided it was time to make an authentic truffle cocktail, one with all that earthy, umami goodness. The Black Moth Vodka is infused with black Périgord truffles and it is not the easiest liquor to get ahold of. Considering the price and the unusual flavor, that's understandable. I ordered mine here but they also have 30 milliliter nips which are perfect if you just want to try this vodka out. 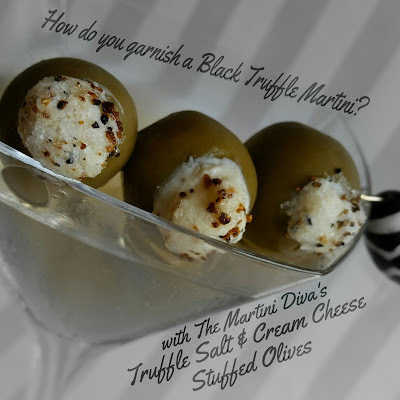 DIRECTIONS: Mix half a teaspoon of the Truffle Salt into 1/4 cup of soft cream cheese then stuff this into green olives. Dip the cheese end of the olive lightly into more truffle salt. Slide these onto a cocktail pick. Combine the ingredients with ice in a cocktail shaker and shake until well-chilled. Strain into your chilled cocktail glass, garnish and serve. You'll note I used a dry sherry instead of vermouth. This is because I did not like the botanicals in the vermouth combined with the truffle flavor in the vodka. It's often fun to experiment with different fortified wines for a unique martini style cocktail. Manzanilla Sherry comes from a Seaside area and brings an interesting salty tang to the cocktail which, I think, complements the truffle.